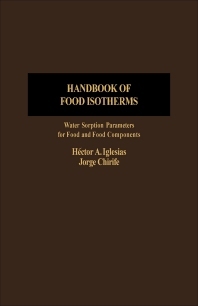 Handbook of Food Isotherms: Water Sorption Parameters for Food and Food Components is the first English handbook entirely devoted to water vapor sorption data of foods and food components. It contains more than 1,000 isotherms with the mathematical description of over 800 of these isotherms. The water sorption isotherms of foods show the equilibrium relationship between the moisture content of foods and the water activity at constant temperatures and pressures. Composed of three chapters, this book initially discusses the main types of changes in foods affected by water activity. It goes on describing the principal methods of water activity determination, namely, gravimetry, manometry, and hygrometry. Data presented as plots of moisture content versus water activity are given. The last chapter presents several mathematical equations for describing water sorption isotherms of food materials. It emphasizes a statistical analysis on fitting abilities of various two-parameter equations as applied to each experimental isotherm collected. It contains tables of parameters for mathematical description of food isotherms. Supplementary texts on nonlinear regression program used for determination of statistical parameters in this text are also provided.